David Guy grew up around cars. The forty-four-year-old has fond memories of drag meets and hot rod shows from his youth, spending time with his father and the Thunderbirds hot rod club in Melbourne. Not many of these stories end with a full father-son resto project though, and what a project for them to take on; Kevin Monk’s old Dodge Challenger race car. The Dodge has had quite an illustrious history. 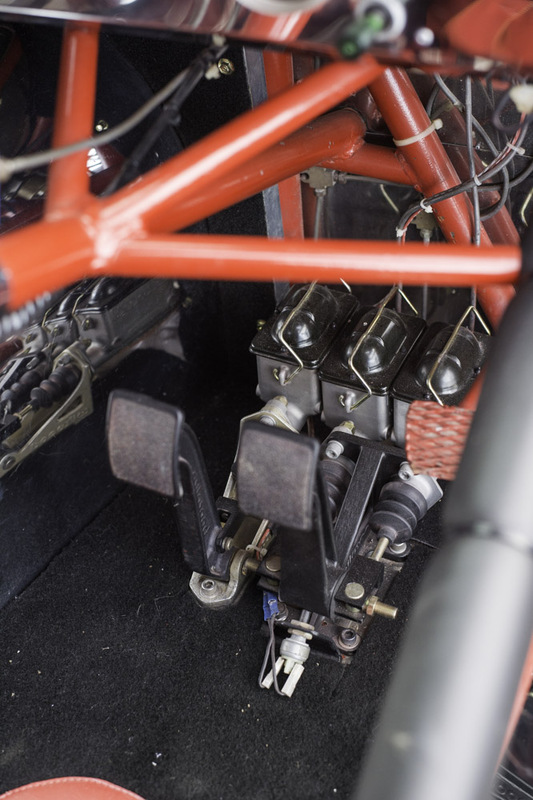 The engine is the same one that propelled NHRA racer Don Carlton to the Pro Stock World Championships in the USA in the 1970s. Carlton and his team were unbeatable for years and he most famously piloted the Motown Missile and Mopar Missile pro stock cars, vehicles renowned for their marriage of engineering, technology and power. The Challenger sports a Don Carlton prepped 426 Chrysler factory pro stocker, which more than powers the outfit. “The Challenger was originally built by Kevin Monk in Queensland who originally bought it back in 1990 in Houston, Texas. Whilst he was there he bought all the parts needed for the build, which took him three and half years. When we first got the car it was in pretty average condition. It had no motor or gearbox, it had damaged paint and was in need of a lot of TLC,” says David. “We had to get it trucked down from the Gold Coast to Victoria. When we got it off the truck and started to look over the body, that’s when I noticed the paint starting to lift in certain spots. It was then I realised it had to be stripped down to see what was underneath and holy crap, body filler front to back, top to bottom. That was enough for me to take the lot back to bare metal, so that's what I did with help from my panel beater mate who knows how to metal finish with hammers, dollies and files. The Dodge had its soul back and David and his dad weren’t about to mess with a classic. “We didn't want to take too much away from its original look, so we personalised it by doing a few things our own way without spoiling the soul of the car. The Challenger was originally all painted in a darker shade of red. We’ve left the chassis in that colour, what you can see underneath is still the original paint. But we chose a new, brighter red for the body. We’ve put different rims and tyres on the front, slicks on the back. We took the hornet scoop off the bonnet, built a new aluminium rear wing, installed a 180 mph Simpson chute, retrimmed the seats, added carpet and replaced all the side markers and front/rear light lenses.” The car was almost complete. It sounds like a quick and easy job, but the Dodge build has been a labour of love, spanning an entire decade, and many late nights. “On and off for the last ten years my dad, my mate Jamie and I have been working from Dad’s shed, fully stripping the body back to bare metal, replacing the bottom right hand quarter panel in the process. Jamie then went in and mostly metal finished the body fully and we resprayed it in PPG bright red two pack. All the bodywork was completed by Jamie and I and getting the body straight and ready for paint was by far the most challenging part of the build. 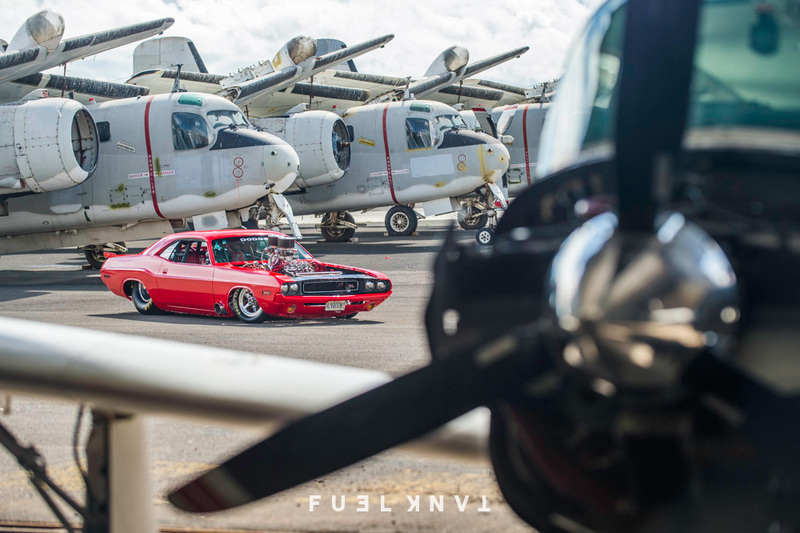 I had entered the car in the 2016 Victorian Hot Rod Show in Melbourne which gave us a tight deadline for it to be completed and ready to shine.” The team made it in the nick of time and the Challenger made its appearance at the show to rave reviews. He continues: “The Dodge won't competitively fit into any established ANDRA classes that I'm aware of except for the nostalgia class. We would like to have a play with those guys on our new local track, Bairnsdale Motoplex, which is a 1/8 mile concrete track. We don't have any plans to run competition classes because this was a father and son project we did to have some fun at our local track and a few local car shows.” It’s a refreshing perspective from a team that obviously knows their car has what it takes. David and his father clearly know their stuff, and have put the time in to build a car anyone would be proud to own. Their humble attitude is a refreshing take in the world of show quality restorations. “My father was approached by two Castrol reps about six years ago and asked if he would be interested in putting their logo and colours on the Dodge after they had seen a photo of it on the wall at one of our local pubs when they passed through one day. He declined their offer because that's not what we bought the car for. We just wanted to have some fun with friends and family.” Mission accomplished. Not one to rest on his laurels, David has the next few years mapped out already. “I've played with many cars over the years but this is my first and only muscle car father-son project. My next big plan is do up a 1963 Rambler Wagon 660 Cross Country with a factory 287 V8 that has been patiently waiting in my shed for its turn. I will have help from my own son Joseph,” beams David. It seems history might repeat itself, which in this case could be a very good thing. The publishers would like to extend special thanks to Steve Church and West Sale Airport for assistance with the shoot. 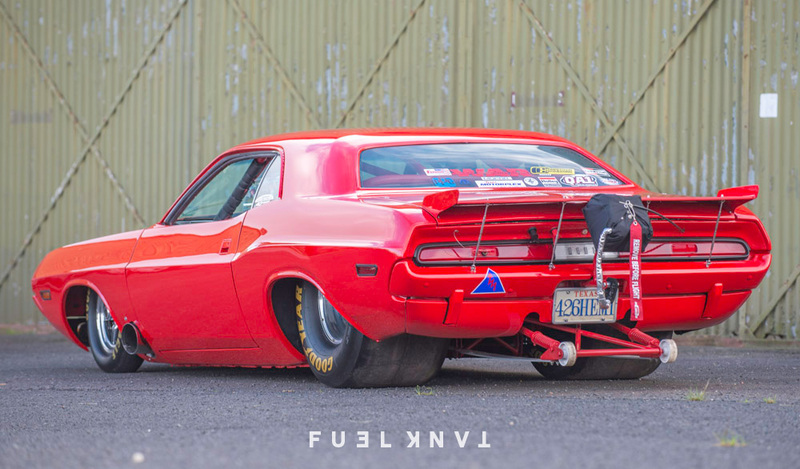 1970 Dodge Challenger with a full Chris Alston prolink chassis kit, Alston column and 5th wheel. Wilwood discs front and rear. Narrowed Dana 60 with 5.86:1 diff centre and Dana 60 axles, front suspension, JC struts and Koni coil. 15x14 Weld Prostars on the rear, 15x3 1/2 Aluma stars on the front. Goodyear slicks. Trimmed in 316 stainless steel and fitted with a Jones mechanical tach, Autometer gauges and SAAS race seats, reupholstered. Don Carlton prepped 426 Chrysler factory Pro Stock engine with friction, polished oil ways and side oilers with a Kellogg billet crank. Arias 13.5:1 pistons (final ratio of 15.3:1) Hastings moly rings, Bill Millar aluminum rods with BME rod bolts. Reed Pro Stock roller cam provides .855 lift and 337 degrees duration and links to a Pete Jackson dual idler valve timing drive. Oberg ‘tattletail filtering’ to keep everything running smoothly. Chrysler Pro Stock aluminium valves covers. Weiland prostock tunnel ram intake manifold fitted with 2 Holley 1150 dominator carbies. Stainless steel headers with 2.5 inch primary and 6 inch collectors. Don Carlton and crew take the credit for the transmission, a clutched 727 Torque Flight with Hays single plate. The engine is good for a genuine 980hp at 9400 rpm. The engine itself has plenty of history having propelled NHRA racer, Don Carlton to the pro stock world championships in the ‘70s.